When I was a teenager, I badly wanted a Mustang. But I couldn't afford one. With a price tag of $2,368, it cost more than I could make in a year back then. Promotional studio shot of a 1964 Ford Mustang, 1964. This first series of the popular pony car is generally referred to as "1964 1/2 Mustangs"
because they were not rolled out in October 1963 with the rest of the new 1964 Ford cars. America can't make a decent car and this is no exception. In 1961, Ford Division Vice President and General Manager Lee Iacocca had a vision: a sporty car that would seat four people, be no more than 180 in. long, weigh less than 2500 lb, and sell for under $2500. On March 9, 1964, vision became reality as the first Mustang rolled off the assembly line. 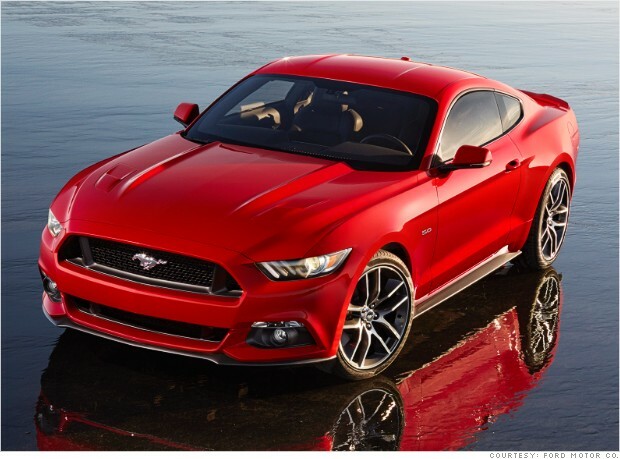 By the end of the day on April 17--the Mustang's official on-sale date--Ford had sold over 22,000 units, and the ponycar revolution was on. It remains one of America's most popular nameplates and makes a superb "first classic" and weekend playtoy. In the Mustang's first three years of production, three assembly plants (San Jose, Dearborn, and Metuchen) managed to crank out 1,288,557 cars, and, due to the Mustang's continuing popularity, many are still on the road today. We make great cars!!! I learned this from my top Gear presenters (in England) that the Ford Mondeo is one of those the top of the food chain as far as sales and economy goes over there in England. I hear you guys cant get enough of them... FORD!! Sieg Heil!!! I love how they sounded....a 1991 (or so) GT rumbling next to you..was nice.. Never drove one though. Here is a picture of this year's 50th anniversary model. (04-14-2014, 12:31 AM)velvetfog Wrote: Here is a picture of this year's 50th anniversary model. you're mistaken, vf. that is an after market conversion of a ford mustang by roush racing. (04-14-2014, 12:47 AM)sporkium Wrote: you're mistaken, vf. that is an after market conversion of a ford mustang by roush racing. I just googled for this year's model, and selected a photo from Google's image page.